Personalized staff profiles are allocated to each of your staff members allowing you to set your staff permissions, update their records and view or amend details instantly. Add staff images. Send internal memos and view clocking history all in one place. This is an automatically generated field. The club reference is either automatically generated or can manually entered. In Options > Additional Club Details there are additional settings to generate the club reference. Enter in the staff members full name. Enter in the staff members address. Enter in the staff members zip code. Enter the dancer's date of birth. Note the staff member's age is indicated the to the right. If under the age limit the label turns red and does not allow the record to be saved. See Options > Club Settings for more information. Set this date to when the staff member has started working for the club. Set this date to when the staff member finished working for the club or is finishing. Enter in a value the staff member gets paid per hour. This is roughly calculated on the Staff Timetabling system. Select what type of staff member they are from the list provided. Enter the staff member's job title. Not all staff will need to login to BoothPoint, only staff where this option is checked will be visible on the login screen staff list. For example security staff won't need to login. Un-tick this box to set the staff member as in-active then save. 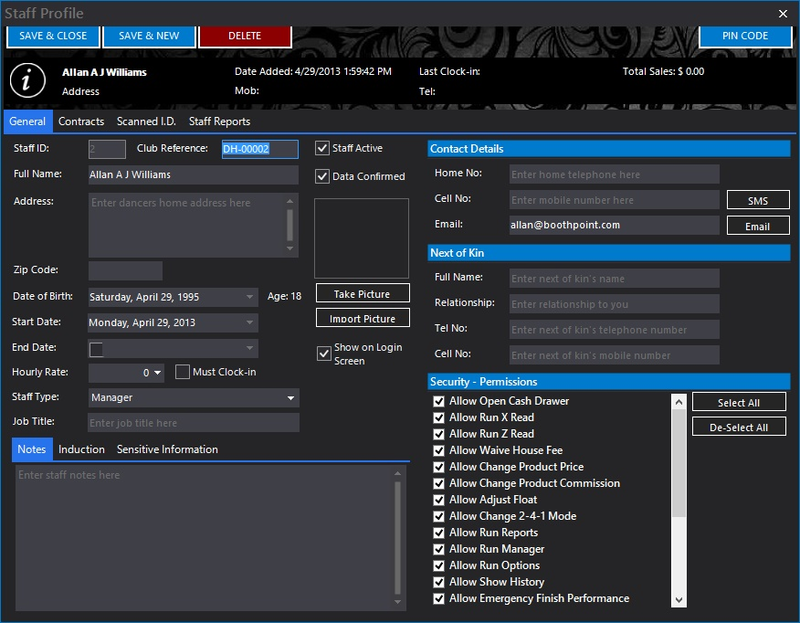 In Options > Additional Club Details there is an additional setting to Confirm Dancer/Staff Data Records. This is used primarily for a chain of clubs who want to make sure the new staff, dancers etc profiles have been filled in correctly and fully. Enter the staff members home telephone number. Enter the staff members cell number. Note to the right of the cell number is SMS button. Tap or click this send the staff member a text message. See Send a SMS Message for more information. Enter the staff members email address. Note to the right of the email is Email button. Tap or click this send the staff member an email from the club. See Emailing Staff for more information. Enter the staff members next of kin's full name. Enter the staff members relationship to the next of kin's. Enter the staff members next of kin's telephone number. Enter the staff members next of kin's cell number. Enter any type of notes relating to the staff member. Select the staff member who ran through the induction process with the staff member. Enter in the date of the induction. Enter in the date when the uniform was issued. Enter in the staff members social security number. Enter in the staff members passport number. Enter in the staff members bank account number. Note this field is encrypted. Enter in the staff members bank sort code. Note this field is encrypted. Enter in the staff members bank account name. Note this field is encrypted. Enables the user to run a X Read on the terminal and or back office. Enables the user to run a Z Read on the terminal and or back office. When a dancer clocks in, there is an additional house fee item added. This enables the user to waive the dancer's house fee for that session. When the user adds products into POS for the customer to purchase, this permission allows the user to change the price of products. When the user adds products into POS for the customer to purchase, this permission allows the user to change the commission of dance products and stage shows. This permission enables the user to change the float in the till at that point. This permission enables the user to view all reports in the back office. This permission enables the user to open and sign into BoothPoint back office. This permission enables the user to view and change the BoothPoint options. This permission enables the user to view sales history in the ePOS. When a dancer is on a private dance, sit down or VIP there is an option to Emergency Stop Customer and Emergency Stop Dancer. This permission enables the user to perform both functions. This permission enables the user to put through petty cash items on the ePOS. This permission enables the user to register new dancers on the back office. This permission enables the user to the built-in back up facility. This permission enables the user to actually exit the ePOS system and return to the desktop. This permission enables the user to select the Pay Later button on the ePOS. This permission enables the user to lift cash on the ePOS terminal. This permission enables the user to issue free passes to dancers from any terminal or back office. When a dancer is on a private dance, sit down or VIP there is an option to Swap Dancer. This permission enables the user to perform this functions. Note if this function is ran the commission goes to the new dancer. When the user adds products into POS for the customer to purchase, this permission allows the user to remove the items from the purchase list. There are reports to show who has voided what items and when, click here to see more.